A Plymouth Rotary Club that donated £1,000 to brain tumour research at Plymouth University has visited its laboratories to find out more about the work taking place to find effective treatments to fight the biggest cancer killer of children and adults under 40. 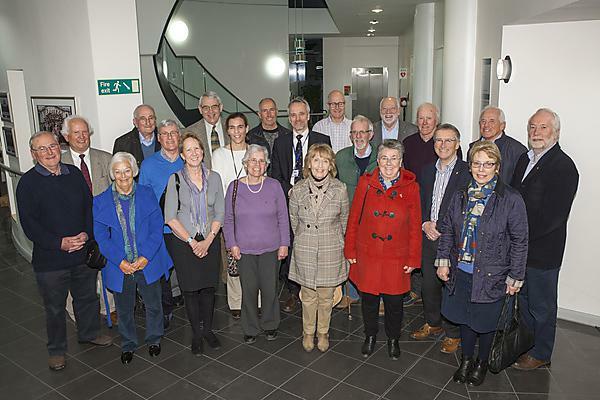 During the visit to the laboratories at Plymouth University Peninsula Schools of Medicine and Dentistry, the Rotarians met with and saw the work of scientists in Europe’s leading research group for low grade brain tumours, which typically affect children and young adults. Research focuses on identifying and understanding the mechanism that makes a cell become cancerous. Plymouth University scientists are exploring ways in which to halt or reverse that mechanism. An innovation will be testing new drugs in human primary cell cultures leading to innovative phase 0 trials. It is hoped this will be followed by adaptive phase II/III trials with the potential for making drug therapies available to patients safely and more quickly. The team at Plymouth University is one of four Research Centres of Excellence supported by charity Brain Tumour Research. The funding from Norman, Saltram Rotary Club and the Peninsula Medical Foundation is supporting PhD student Foram Dave. Foram has a masters degree in biotechnology from VNSGU in India and a masters degree in molecular medicine from Brunel University, London. She has come to Plymouth University Peninsula Schools of Medicine and Dentistry with a wealth of research experience gained in India and in the UK. Her research project focuses on the NF2-related, nervous system tumours such as schwannomas, meningiomas and ependymomas, characterized by the deficiency of tumour suppressor merlin. NF2 is a hereditary disease and affects 1 in 25,000 people worldwide. However, these tumours may also occur spontaneously in non-NF2 patients. Patients experience different symptoms, depending on the location of the tumour which may include hearing loss, vision problem, and balance impairment. Foram’s work is of particular importance because conventional chemotherapy is ineffective in NF2-related tumours and current therapies like surgery and radiosurgery have impact on patients’ quality of life and survival. In severe cases patients suffer multiple tumours which are not possible to remove surgically and may often lead to life threatening complications. Therefore, new effective and drug based treatments are urgently needed. If you would like to support research at Plymouth University, including Foram’s PhD, please visit www.plymouth.ac.uk/campaign, email campaign@plymouth.ac.uk or call 01752 588045. Your support can make all the difference.